Books Eleven and Twelve of Paradise Lost and their radical departure from the poem’s previous style are discussed. The transformation of Milton’s famously sonorous verse into a more didactic mode is closely documented, and the poem’s increasing emphasis on visual instruction is underscored in a study of the Archangel Michael’s lesson on the history of the post-fallen world. Considerable time is devoted to both a consideration of Milton’s late politics and Book Eleven’s depiction of the destruction of paradise. 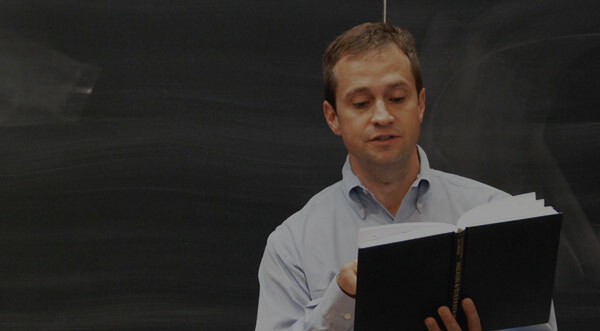 Professor John Rogers: Readers typically finish the last books of Paradise Lost with – I don’t know, I certainly had this experience the first time I read it and, I think, actually many times since then – with something like a sense of disappointment, and the disappointment that is traditionally accompanied these last books is usually associated with the question of their style. Michael’s prophetic vision of future history is laid out before Adam with – and you get this sense – with a kind of labored and painstaking didacticism. We so miss Raphael, I think, that the affable Raphael had charmed us with that endearing uncertainty that he had about the structure of the cosmos, for example. Was Ptolemy right? Was Copernicus right? Who cares? Raphael made an art out of his uncertainty, and he seemed to place his blessing thereby on all of the ambiguities and all of the ambivalences and uncertainties that filled nearly every line of the poem. But everything, or nearly everything, changes with the appearance of the Archangel Michael. Michael’s speech is much less open – there’s no question about this – to a proliferation of signifying possibilities. He speaks in labored, declarative sentences and his purpose seems above all to provide Adam with a powerful sense of his culpability, Adam’s culpability, for the hell that is future history. I mean actually hell quite literally because there’s an important way in which the last two books of Paradise Lost provide us with a kind of mirror of the first two books. The catalog of fallen history that we have at the poem’s conclusion reproduces and rehearses a lot of the patterns of behavior that were established in the first two books. David’s lecture on Friday has made me think of the ways in which sometimes what seems to be the futility of human action and human behavior in the last two books also harkens back to an earlier time even before the events recounted in Books One and Two – and that’s, of course, the war in heaven. The pointlessness of the war in heaven on some level gets reproduced in – in the sense that we have sometimes of– the pointlessness of life [laughs] after the Fall in the last couple of books of the poem. But like the war in heaven, there is a kind of heroism that’s possible in the last two books of Paradise Lost. I won’t be talking about this at any length, but it’s an important part of Milton’s conception of history and it’s often referred to as Milton’s “one just man” theory of history. Every generation seems to have one man who is willing to stand alone and stand apart from the corruption of the crowd, and that man will do everything he possibly can – on some level it’s still going to be futile – to advance the civilization and the level of spiritual excellence of the people that much further. The one just man in the war in heaven was, of course, the angel Abdiel with whom Milton himself felt himself so identified. Well, in any case, think of Book Ten. Book Ten had been filled with a catalog of the punishments that Adam and Eve had to endure as a consequence of their behavior, but it seems at times as if the harshest punishment of all that comes as a consequence of the Fall will be Adam’s subjection to the catechism of Michael in Books Eleven and Twelve. Adam is subjected to an instructor, an instructor whose grim sense of humor, whose abrasive sarcasm, and whose unfeeling didacticism all contribute, at least to my mind, to a sensibility utterly foreign to that of the first [laughs] ten books. If we as the sons and daughters of Adam and Eve are to be punished, it seems as if we, too, are to be punished for that original sin. How are we punished? We’re punished because if we want to finish this stupid poem we have an obligation to read and experience Michael’s uncompromising pedagogy, his teaching of Adam. Now, the literary style of the last books may be that aspect of them that first incites our disappointment, but it’s certainly not the only disappointing element of those books. We’re also disappointed with the actual content – I’m disappointed with the content of Michael’s history. I will continually be harkening back to Raphael who seems so much more affable in retrospect than maybe he did at the time. We remember Raphael’s teasing account of future history in Book Five. You’ll remember this. If Adam and Eve could only remain sinless, if they could only remain obedient, then their future might consist of that grand but slow transmutation into the ethereal matter of angels. It was really quite beautiful, but Adam and Eve, of course, did not remain sinless and their future history necessarily has to look disappointingly different from that natural history that Raphael had been able to anticipate. Now most critics, most Milton scholars writing about the last two books of Milton’s poem have invested their time – and you can understand why this is necessary – have invested their time in defending books Eleven and Twelve, and there’s a certain kind of nervousness about the unpleasantness of the conclusion of this poem. Critics are continually – and I think this is misguided, but I understand it nonetheless – they’re continually attempting to shelter the poem from the accusation that its ending represents something like a disappointing falling off. Now I think these critics are right, they’re absolutely right, to insist that the last books are supremely artful creations – that’s undeniable – and that Milton displays in them his sophisticated engagement of biblical history and of theology. Milton takes extraordinary care in crafting the process of the education to which Adam is subjected in the last books. That said, I think it’s a mistake, or I’m convinced it’s a mistake, to deny the fact that these books are, in addition to all of that, disappointing. So I think we can profitably examine why it is that Milton ends his poem with these last books, Michael’s severe treatise on scriptural history. Now, these last books mark Milton’s only attempt in Paradise Lost to represent what we would think of as actual human history. In order to understand why this section of the poem is so troubled and so worrisome, we have to understand Milton’s own brush with history, his own participation in the disappointing history of the failed Puritan Revolution. Now Milton has taken great pains to keep from his poem anything like a direct allusion to the political turmoil of his own day, but what I am hoping I’ll be able to do, at least for a few minutes here, is to show one of the ways in which Michael’s treatment of scriptural history is still intimately connected to the contemporary political history that Milton was himself enmeshed in. Now, you may have noticed that the work of Milton’s political prose by far that I have most consistently cited over the course of these lectures – or written little things on the board [laughs] in quotation of it – is Areopagitica, the speech against licensing that Milton had printed in 1644. There’s a way in which that exuberant liberalism of Areopagitica was continually resurfacing in the most interesting and, in a lot of cases, the most daring passages of the entire poem. We remember instances in which Belial and, at another point, Eve seemed to be actually alluding to Areopagitica or certainly reproducing arguments that Milton had made there, and so I devoted a lot of attention to Areopagitica; but in doing so I think I’ve also distorted, maybe kind of drastically, the truth about Milton’s political sensibility in the very years that he was writing Paradise Lost. Milton’s epic poem appeared over twenty years, or twenty-three years, after the treatise on licensing; I’ve given you a sketch of this history before, but it’s worth looking at at another time. In the mid 1640s, Milton was really at the height of what we can think of as his liberalism, even though that word wasn’t yet in existence. Milton was wildly optimistic about the success of what he felt to be the Puritan Revolution, and he seemed genuinely confident that something like a rational, spiritual, Puritan utopia could actually be established on English soil. At the center of his political optimism was his faith in the political category that Milton called “the people.” When he was writing in Latin, he would use the Latin for people, which is populus. Throughout the 1640s, up to 1650, Milton was confident, really exuberantly confident, that God had infused the power of reason and virtue into every single human individual and that this God-given capacity for reason and virtue would enable the English people, the populus, to govern themselves in an entirely non-authoritarian, almost completely egalitarian political structure. I think you can see most dramatically – and this is a treatise that we haven’t read in this course, but it’s included in the Hughes – you can see this faith in the self-rule of the people in Milton’s 1649 treatise, really the greatest of all of what we call the regicide treatises: The Tenure of Kings and Magistrates, in which Milton actually actively advocates the regicide. There’s almost a sense in The Tenure of Kings and Magistrates that you don’t even really need any kind of formal governmental structure at all. The people are actually going to be able to govern themselves without any other edifice. There turned out to be a problem, however, with Milton’s political idealism, and that problem no doubt involved the fact that Milton’s political idealism seemed to have had no basis whatsoever in reality. Milton may have been convinced that God had infused every single human individual with this power of rational self-rule, but the actual people, the actual populus of England, turned out not to be so easily convinced. The real English people themselves were considerably more conservative than the small Puritan elite who had pushed for the execution of Charles the First in 1649 and who had placed themselves at the head of the new, non-monarchic, republican government. If anything, the majority of the English people themselves were in favor of monarchy, and so Milton found himself, as so often, compelled to modify his own political idealism. By 1650, Milton wasn’t able to say that the English should be governed by the people – by 1651, I should say, he was no longer able to say that, that on some level the people obviously couldn’t be trusted any longer to get it right. So he had to weaken his claim that the people were all rational and self-governing. He began to forward a much less idealistic principle of government, and that was the government of England by a small elected body of people called Parliament. Parliament had existed well before Milton, before this new turn in Milton’s political philosophy, but Milton was placing an entirely new importance on this body. So maybe the people themselves aren’t all that rational and virtuous and self-determining, capable of self-government, but surely Parliament – this is the new turn in Milton’s thinking – an elite group of the people, can be counted on to uphold Milton’s own value of rational self-determination and rational self-rule. Well, the republican decade wears on, the 1650s, and by the time we get to the end of the decade, the kingless government of England – under the rule of Oliver Cromwell and later under the rule of Cromwell’s son – this republican government is getting closer and closer to a complete collapse. There’s a widespread popular movement: it’s a movement fomented by the people seeking the return of the Stuart monarchy, and this time it’s not only the common people who are calling for the return of their king. It’s also Parliament who has – from Milton’s perspective, Parliament has entirely sold out; and so by late 1659, there is a majority now even in Parliament desiring – this is again Milton’s construction of it – desiring to re-subject the English people to the tyranny of monarchy. So in 1659 when Milton is writing his final political treatise, he’s compelled to alter his views once again, and he finds very little evidence of the rational, virtuous, ethical principles that he had been so confident about in Areopagitica, this idea that all human individuals possess the virtue and the reason and the spirit that he had previously attributed to them. It starts to seem as if all men are actually not created equal and that very few of them have anything like divine virtue or divine reason infused into them by God. So now the people that Milton had once so wonderfully and movingly idealized, he’s able to refer to – and it’s really kind of jarring and, just frankly, it’s depressing – Milton’s now able to refer to the people as the – and I’m quoting here – “the rude and inconsiderate multitude,” the unruly mob. You have a whole elaborate lexicon of invectives concerning the people in the last political treatises of Milton’s. Milton imagines, because he can’t even count on Parliament – he comes to insist that the unruly and irrational English, these masses, are ungovernable even by Parliament. So the governing body is going to have to be an even smaller group, a collection of England’s most rational and most spiritual men, men of course, who look exactly like John Milton himself: so a group of men more excellent than the far-too-large mass of people that constitute Parliament. You have something like what’s essentially a spiritual elite. This spiritual elite would have to govern England, and Milton thinks of them as a council of saints; he refers to them as a council of saints. So in a little more than a decade this political idealist has shifted from his celebration of the power and the liberty due to the people to a depressingly shriveled sense – and it is pretty shrunk and pretty pitiful thing – of the power and liberty only due to a very small group of like-minded Puritan revolutionaries. So a lot of the liberal confidence of a work like Areopagitica just disappears by the time we get to Milton’s late political prose. Just how depressing this shift is will become clear to you when – have I assigned The Ready and Easy Way to Establish a Free Commonwealth on the syllabus? I may have taken it off this year because I did not want to depress you, but you should not let my attempt to protect you from what might seem the ugliest parts of Milton from taking advantage of Hughes’s inclusion of that important and interesting text in your edition. Milton will argue in The Ready and Easy Way that he wrote in 1659 that this new spiritual council, the council of saints, they should actually be permitted to deploy military force if necessary to subject the unruly masses to their will. This is how the argument goes, and it’s a disconcerting one: the people are now so little to be trusted that they have to be forced to recognize, at gunpoint if necessary, their God-given liberty and their God–;[laughs] given capacity for self-rule. Of course, it goes without question there’s a horrible paradox there. Milton seems to be arguing that the people will govern themselves – goddammit! – even if they have to be forced to do it. So this final plan – this is Milton’s final political scheme – is something like a junta of Puritan saints. Of course, the scheme was never enacted. Shortly after Milton proposed it, the republican government completely collapsed in early 1660, and Charles the Second, the dead king’s son, was returned to the throne and monarchy was restored. And Milton – think about the position that he’s in. Milton was actually placed in prison for a while for his writings against the king, and he was generally living in some degree of poverty and certainly in disgrace. All of this is a very long-winded way of saying we have come a long way by the time we get actually to the composition of Paradise Lost. We’ve come a very long way from the moving idealism of Areopagitica. Milton has endured an entire decade of political disappointment and I think it’s possible to see the relation between the fall of Milton’s own political idealism over the course of a decade and a half or so and the fall of man as it’s represented in Paradise Lost. Milton’s able to use the narrative of the fall of paradise in some way, I think, to map his own experience with the loss of the English commonwealth, the English commonwealth that Milton had really seen as something like a paradise of Puritan saints. You could think of Adam and Eve after the Fall, in a lot of ways at least, as a version of the English people for Milton in the late 1650s. They show surprisingly few signs of internalized divine reason and internalized virtue, and so this is why – at least, I think this is why Milton has to introduce into his narrative this irritable Archangel Michael, and this is why Milton stages this scene of angelic instruction so differently from the way he staged the scene with Raphael. I only need to mention Eve’s role in all of this. Eve, you’ll remember, decided on her own not to stick around for Raphael’s lessons in astronomy. She’d just as soon learn it, she told us, [laughs] later from Adam, whose pedagogy was a little more interesting than Raphael’s because Adam interspersed his lessons with kisses. That was Eve’s choice, and Milton goes out of his way to represent that as Eve’s choice; but after the Fall, Eve is not given that choice. She’s forced to absent herself here and Adam, who gets to stay – it’s not clear what kind of privilege that is – is subjected to the severity of Michael’s teaching on some level because he can’t be trusted to behave as a rational, self-governing individual after the Fall. Someone is going to have to teach him, and in fact teach him quite forcefully, how to understand life in the fallen world. So Michael enters onto the scene and – I think this is his goal, at least – to instill in Adam the powers of reason and virtue. He does this by means of a history lesson, something that before the Fall, Adam seems to have possessed instinctively – or rather, it was a kind of reason and virtue that he possessed instinctively, but now it needs to be instilled. Michael presents Adam with the sweep of Christian history and with the promise of man’s eventual redemption from the Fall, and it’s this entire lesson that Adam is going to have to internalize, literally take in to himself. The last two books of Paradise Lost, I think in a lot of ways, represent something like a drama of internalization. One of the important aspects of these books is what they have to tell us, I think, about the complicated psychological process of the internalization of any kind of authoritative wisdom. So we’re finally now in a position actually to look at the poem. Look at page 442 in the Hughes. This is Book Eleven, line 411. Michael’s history lesson is really quite extraordinarily, carefully organized. It’s broken up into two discrete sections, books Eleven and Twelve, and these two discrete sections proceed along entirely distinct lines. The first half of the lesson, which takes us up to the moment of God’s destruction of the world with Noah’s flood, is presented to Adam as a vision, and Adam sees this early history unfold itself. This is something that comes to him through the access of his eyes. The second half of the lesson, which is the entirety of the lesson as it exists in Book Twelve, is not presented to Adam visually at all. Michael simply describes it to Adam. He relates it in the form of a narrative. This shift from vision to narrative has everything, I think, to do with the psychological process of internalization that Milton is exploring in the last books. I think it has everything to do as well with the shift in literary style to which Milton subjects the ending of his great epic. The turn to the new style of books Eleven and Twelve is in a lot of ways analogous to Michael’s turn to didactic narrative in Book Twelve after the grand tableaus, after all of the visual splendor that he has conjured in the visions – the masks the tableau vivant essentially – that Michael presents to Adam in Book XI. This new style is geared even more intensely toward the project of internalization. It places a greater and greater burden on Adam and certainly on the reader to ascertain its significance. There’s something about the ophthalmological specificity about this passage that really gets me. This account of what Milton is telling us was actually done to Adam’s eyes in order to allow him to see the unfolding of Christian history. The ingestion of the forbidden fruit seems to have weakened his eyesight, and so the new film that has come to cover over Adam’s eyes has to be purged with these herbs, Euphrasy and Rue. Michael goes even further than that and adds for good measure three drops from the well of life in order to permit Adam to see in his mind’s eye sights impossible even before the Fall. This scene of inspiration, I think, is strange, but of course it has a powerful charge for us, not least because for so much of the poem the poet himself has claimed to be inspired in his composition of the poem, and we know this: Milton was blind and he was convinced that something – or at least this is the William Kerrigan argument that I exfoliated for you all – he was convinced that something that he had eaten had on some level been responsible for the vaporous film that seemed to have covered his eyes. In the invocation to Book Three, you’ll remember Milton bids the muse Urania to purge him of that film: “all mist from thence / purge and disperse, that I may see and tell / of things invisible to mortal sight.” Milton’s clearly drawing a connection here between his own inspiration to write Paradise Lost and Adam’s preparation to witness the vision that is future Christian history. That much, I think, is clear, but what exactly does this connection mean? What is the relation between Michael’s vision in Book XI and the inspired epic poem that Urania – the heavenly muse, the heavenly spirit, or whatever we’re supposed to call that entity – that this entity helps Milton to write? I welcome other possibilities, but I think the relation seems to be something like an ironic one, and that irony is suggested, I think, by the weird chemical exactitude of Milton’s description of Adam’s inspiration. We have an actual scene of medically induced inspiration at the very moment that the inspiration of the poem itself seems to have been lost and comes to a stop, the loss of innocence that has brought with it the loss of Milton’s – or what I think we were associating with and identifying as Milton’s – inspired poetry. Milton carefully crafts his account, I think, of this vision of poetry in a poetic style that can only with great difficulty be described as inspired. It’s these last two books are amazing works of art, but we don’t have anything like that extravagant and dramatic rhetorical lushness that had so characterized the previous ten books. What you have in Book Eleven is Milton’s enactment, in some way, of the birth of what we can think of as modern poetry, a poetry that’s been purged of excess and purged of all of that open-ended figuration. Think of the Renaissance and the literature of Spenser and Shakespeare. The Renaissance called the amplitude of its great writers copia. We no longer have that copia here in the last two books. We have a poetics that is given to Puritan austerity and simple declarations of moral facts, and you will see that the poetic mode of Paradise Regained and, in fact, the poetic mode of a lot of later poets – I’m thinking of the discursive poetry of a Romantic poet like Wordsworth – has been heavily influenced by the last two books of Paradise Lost. So Adam has to be chemically induced to see future Christian history because all other inspiration in the poem is no longer operative. Adam has to be compelled, literally compelled, to see how this history unfolds itself in the manner of little pageants and little skits. He has to see it, of course, because he’s not able at this stage in his development to understand its import through the non-visual faculty of imagination. I think Milton, the inspired prophet, has an incredibly and troublingly complicated relation to Adam at this point – Adam, who is so uninspired in this poem that Milton has claimed to be so overly inspired to write in the first place. My guess is that the blind poet, Milton, is actually scornful on some level of the fact that Adam has to be inspired merely to see the events of future years. Milton’s own prophetic powers presumably entirely transcended the entire category of the visual. Now we might reasonably expect that Milton’s one and only representation of a human musician in the poem, a figure whose artistic touch is a lot like Milton’s, “instinct through all proportions low and high” – we might expect that this would appear in a favorable context. Why would we not? But, as in so many [laughs] other instances throughout these final books, Milton, who has so absolutely become our stereotype of him as the humorless Puritan, is turning on – he’s really betraying the very art of sound that constitutes one of his poem’s greatest achievements. There has to be something self-wounding here in this derogation of music, and I don’t care that it’s fallen music. So the faculties of perception here are nothing more than the vehicles of deception. They’re implicated in this endless replaying of the sexual seduction that is now viewed, mistakenly of course, as the cause of the Fall. Well, dopey Adam here is still at an early stage in Michael’s achingly long lesson in history. Of course, Adam thinks that things with his descendants are starting to look pretty good, and so that’s what he tells Michael at the top of page 447. This is line 598: “True opener of mine eyes, prime Angel blest, / Much better seems this Vision, and more hope / Of peaceful dayes portends, then those two past…” As so often – and this is a pattern that will repeat itself until the book is done – Adam has completely missed the point of Michael’s lesson. He mistakes the pleasant appearance of this scene with moral rectitude itself, and so when Adam tells Michael, “Much better seems this Vision,” he’s really no better than the men who live on the plain who are eying the bevy of fair women and letting their eyes rove without rein. It’s the fact that this beauty is apprehended solely through the eyes, solely through the senses, that, of course, lies at the heart of the danger here. Adam has to learn to exercise his reason, and this is one of the things that Michael gets him to perform eventually. All things beautiful are by definition here suspect, and this is one of the lessons derived from, I think, the most elaborate of all of the classes that Michael offers Adam – and that’s the history of the great flood. Look at page 452. This is line 826. This story is so important that it’s one that’s actually narrated twice. We have first the narrator’s description of the prophetic reenactment of the flood – or rather, it’s not a reenactment, it’s a pre-enactment because it actually hasn’t happened yet. This is the version that Adam actually sees. Then second, we have Michael’s long, play-by-play accounting to Adam of what it is exactly that he has just seen. [This line:] The haunt of Seals and Orcs, and Sea-mews’ clang. Michael’s describing the effect of the flood on Eden. This is the mount of paradise, which, like all other things, will be moved out of its place by the flood and washed into the opening gulf of the ocean. The effect here is not simply on our visual memory of the vegetative splendor of Milton’s paradise: Milton’s assaulting as well our aural memory of the sounds of paradise, our memory of the beauty of the poetic verse that had produced in us our visual sense of the gorgeousness of the Garden of Eden. In the repressive Puritan regime of the last two books, the resonant organ tones of the poem’s earlier books also have to be washed away. So in that amazing line, “the haunt of Seals and Orcs, and Sea-mews’ clang,” Milton creates an onomatopoetic line. What does it do? It actually enacts with a kind of strident horror the squawking, horrible sounds of these sea creatures. It offers us a sonic emblem of the general stridency, I think, of the concluding books: the uncompromising tone of severity that instructs us not to overvalue the lush beauty of the previous books – not to overvalue the beauty of paradise but also not to overvalue the beauty of the poetry of Paradise Lost. Well, a question presents itself at this point and it’s one that I think is inescapable. Why does Eden have to be destroyed at all? “Why is it washed away in Noah’s flood?” we ask. The paradise that was lost, it turns out, wasn’t the significant one. This is an incredibly important part of Michael’s lesson. Look at how Michael explains this at line 836: paradise is destroyed – he’s talking to Adam: “To teach thee that God attributes to place / no sanctity, if none be thither brought / by Men who there frequent, or therein dwell.” Now think of what Michael has just said. The Garden of Eden will become an “Island salt and bare” at least a thousand years after the moment that Michael is currently related this prophecy to Adam. Eden will be destroyed in order to teach Adam at this very moment in the present time that places aren’t divine, only the people that live in them. This is an extraordinarily bizarre temporal disjunction that we have here. Paradise isn’t going to be destroyed for another millennium or so in the time of Noah, but it will be destroyed in order to make good on Michael’s prophecy of its destruction. Paradise has to be destroyed so that Michael’s prophecy of that event can have its proper pedagogical effect on Adam now in the present moment of the narration. Michael attempts – it’s an amazing way to compel the internalization of paradise by forcing Adam to confront its real-life destruction. Now, at the conclusion of these lessons in history – this is near the end of Book Twelve, page 467, line 585 – Michael states in much more formal terms just this lesson of internalization. So, “having listened to my history,” Michael tells Adam: “[T]hen wilt thou not be loath / To leave this Paradise, but shalt possess / A Paradise within thee, happier far.” Once Adam pictures the terrible destruction of paradise, he’ll come to understand that an internalized paradise is superior, and it’s a happy compensation for the lost place of Eden. Readers of Milton, and certainly scholars of Milton, have taken Michael at his word when he tells Adam that the paradise that dwells within will be happier far than the paradise in which he himself is currently dwelling and will soon, of course, be forced to leave. There’s an important sense in which we have to see the inward paradise as the greater and more consequential Miltonic phenomenon. As a radical Protestant, Milton had always insisted on the superiority of inward human reason and of the inward spirit over anything like the visual splendor of churches or the sanctity of so-called holy places – or the written codes, for that matter, of church doctrine. From a doctrinal point of view, there is no question Michael is beyond reproach here; but I still want to apply, because this is what I do, a little bit of skepticism to this little bit of dogma. How convincing is Michael here? Does our learning in one line that the paradise within us is actually happier far – does it really undo our investment, the readers’ investment, in this place, this paradise which has been so lovingly and so beautifully described in the thousands of lines that preceded it? When Michael describes the “Seals and Orcs and Sea-Mews’ clang” that will literally take over the place of paradise, can we help but look back with regret at the liberal beauties of this poem before this strident archangel had taken it over essentially – taken the poem into receivership with his unyielding dogmatism? From the aesthetic point of view, I think Michael’s discourse is a complete disaster. We experience it as a form of loss, and Milton compels us as readers, I think, to experience along with Adam and Eve something like the loss of paradise. We are compelled to undergo the loss of what we loved about Paradise Lost. We are compelled to undergo the aesthetic fall that is taken by this very poem. This is, I think, Milton’s way of precipitating our internalization of his poem. As I mentioned earlier, in the late 1650s Milton was no longer able to justify the extension of political liberties to the people. The English people, to his mind, had fallen and Milton could no longer imagine granting them the kind of freedom of self-determination that he had described so rhapsodically in a treatise like Areopagitica. You can see a related hardening of sensibility really in the last books of Paradise Lost in the fallen reader and the fallen poet. We can no longer afford the moral and theological uncertainty that had been fostered and really celebrated by the sublime poetic style that we can now call, now that it’s gone, Miltonic. It’s as if we can no longer afford the indulgence in all of those stylistic elements of the earlier books that have been so carefully purged from Michael’s lessons in history. It’s as if we can’t afford to indulge in those ethically ambiguous similes, the delectable allusions to the full range of pagan classics, and those extraordinary flights of the poet’s own original myth-making – all of those elements that have made this poem so grand but that have continually, as we’ve charted, threatened to unhinge the story from anything like its basis in moral doctrine or scriptural certainty. The poetic effect that we have here is primarily one of loss and it’s a type of loss that we’ve encountered before in Milton. I’m just about at my conclusion, but I want to remind you of Milton’s first poem, his first great poem, the Nativity Ode of 1629. Milton, you’ll remember, had described the triumphant entry of Christ. His destruction of all of the evil pagan gods and the onset of the Christian era was celebrated as a joyous one; but of course it brought with it a loss that Milton at that time was willing to measure. The pagan nymphs, you’ll remember, felt the pain of their banishment from the beautiful forests of classical literature: “With flower-inwov’n tresses torn / the Nimphs in twilight shade of tangled thickets mourn.” That poem of religious celebration made a brief, but it was potent, detour into elegy, and Milton seemed almost to recognize the painfulness of the loss of classical literature and the loss of the poetic beauty with which we associate classical literature. I think there’s a related sense of loss that attends the otherwise triumphant conclusion of the theological doctrine that Michael presents at the end of Book Twelve. On the doctrinal level, Michael does end on a painfully optimistic note – I know that’s an oxymoron but it still brings me pain – the way in which he represents the promise of man’s eventual redemption. But on an aesthetic level, you have almost the plangency, I think, of elegy – a sad consciousness of all of those pleasures and all of those liberties that now have to be forsaken. Okay. I’m ending the lecture there, but I just want to remind you that that, of course, is not the end of the story. The poem will change a final time. Once again, in its last hundred lines or so you will have the reemergence of a lot of things that we associate with Milton. Certainly we’ll have the reemergence of the epic simile, which we’ll pay attention to closely on Wednesday. So focus for the next class on the poem’s ending.